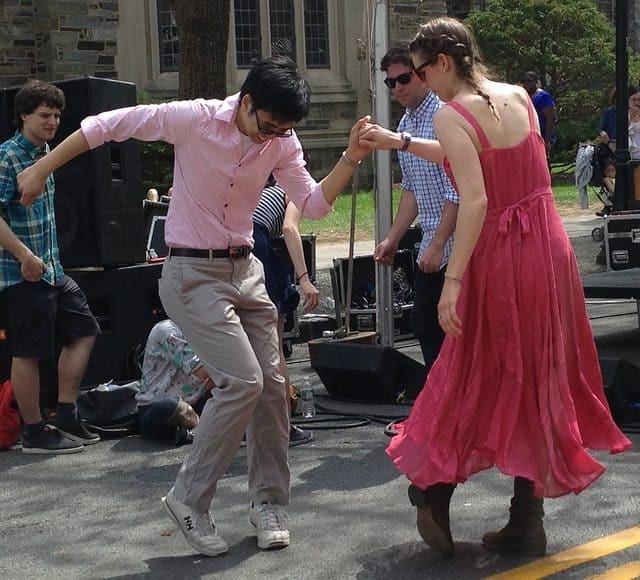 A couple dancing at Communiversity in 2013. Bands will perform on six stages for the 2015 celebration on Sunday. Photo: Krystal Knapp. 6th Annual Princeton Dines Out for Parkinson’s Disease Research – First day of the annual fundraiser to benefit The Parkinson Alliance. April 24 – April 30, dine at any of the participating restaurants and a percentage of the proceeds will be donated to The Parkinson Alliance. Participating restaurants include Blue Point Grill, Despana, Eno Terra, Gennaro’s, La Mezzaluna, Mediterra, PJ’s Pancake House, Teresa Caffe, The Peacock Inn and Witherspoon Grill. Banff Mountain Film Festival – sponsored by Blue Ridge Mountain Sports and the Princeton University Outdoor Action Program, and benefiting D&R Greenway Land Trust and Stony Brook-Millstone Watershed Association, the film festival will be held April 24 and 25 from 7 to 10:30 p.m. in McCosh Hall, Room 10, at Princeton University. Award-winning films feature exotic landscapes and remote cultures, and include climbing, mountaineering, mountain biking, kayaking, extreme skiing and explorations of the natural world. Tickets cost $15, $10 for students when purchased in advance. Purchase tickets on site, or online at www.princeton.edu/utickets or phone the Frist Campus Center ticket office: 609-258-9220. Princeton University Orchestra and Glee Club: Verdi’s Requiem – Led by Maestro Michael Pratt, the Princeton University Orchestra will be joined by the Princeton University Glee Club, directed by Gabriel Crouch, in concert on April 24 and 25 at 7:30 p.m. at Richardson Auditorium in Alexander Hall. Tickets $15, $5 for students. Trinity Rummage Sale Preview – Shop select departments before the crowds! 6:30 p.m. to 9 p.m. at Trinity Church, 33 Mercer Street in downtown Princeton. Participating departments include: antique boutique, art, books, furniture, jewelry, ladies fashion boutique, linens, men’s fashions, and this ‘n that. Tickets $10 ticket. Sold at Trinity on the day of preview sale at the reception desk, which is accessible through the church office entrance on our circular parking lot near the intersection of Mercer St. and Alexander Rd. These tickets are sold on a first come, first served basis. You can buy a ticket, leave and come back later before the sale begins at 6:30 and be assured your place in line based on your ticket number. Princeton Opera Alliance Presents Idomeneo -Following the Trojan war, Idomeneo, king of Crete, has struck a deal with Neptune, god of the sea. In exchange for safe passage across the Aegean, he has promised to sacrifice the first person he meets upon his return to the island. He is overwhelmed with grief when he realizes this person is his son, Idamante. April 24 and 26, 7:30 p.m. Princeton Meadow Church and Event Center, 545 Meadow Rd, West Windsor, Tickets $10 for adults, $5 for students and children. Larry Fuller Trio Performs at the Arts Council of Princeton – From bop to swing to stride, Larry Fuller – direct from New York City – summarizes the history of jazz piano. His stunning command at the keyboard assured him the job as bass legend Ray Brown’s last pianist before joining John Pizzarelli’s Quartet. For the Arts Council of Princeton, Larry will play highlights from his latest self-titled CD, an album of classic standards just released. 7:30 p.m. Admission $12. Trinity Rummage Sale – Biggest spring rummage sale in the area, a must visit for bargain hunters. 9 a.m. to 3 p.m. Clothing, housewares, sporting goods, electronics, books and more. 33 Mercer Street. Shoppers will be allowed in groups of 50 beginning at 9 a.m. Half-price in select departments beginning at 1 p.m. Proceeds go to area charities. Princeton Community Yard Sale – More than 70 households will be participating in the Princeton Yard Sale from 9 a.m. to 1 p.m. A full list is here. Hopewell Community Closet Spring Grand Re-Opening – Lots of spring and summer fashion for folks of all ages and sizes. Gently used clothing will be available for everyone – men, women and children – for a free-will donation or free to those that are financially struggling. The Closet, which includes seasonal clothing, shoes and accessories, is located at the Hopewell Methodist Church, 20 Blackwell Ave., Hopewell, 08525. Shop Hours: Every Saturday: 9-11:30 a.m. Donations of gently used clothing, shoes and handbags will be accepted during business hours. The mission of the Hopewell Community Closet is to provide access to free or low-cost clothing to individuals and families that are financially struggling while maintaining their dignity and providing clothes to meet their needs. Sponsored by the United Methodist Women of Hopewell Methodist Church and the free will donations accepted support UMW missions and outreach. For more information, visit hopewellmethodist.org. Potato Planting at Howell Farm – Join forces with staff and volunteers as they plant a special crop of potatoes that will be harvested on Aug. 15 and donated to the Greater Mercer Food Cooperative and other local hunger projects. Visitors to the 130-acre “living history” farm can join the field crew anytime between 11 a.m. and 3 p.m., when help is needed planting seed potatoes in furrows opened with horse-drawn equipment. A craft program for children, “Potato Bug,” will be held from 11 a.m. to 3 p.m. on a walk-in basis. Cost for craft is $3. The Howell Farm is maintained and operated by the Mercer County Park Commission. It is located on Valley Road, just off Route 29, two miles south of Lambertville (GPS address: 70 Woodens Lane, Lambertville, NJ 08530). Parking and admission are free. Princeton Truck Fest – Second annual Princeton food truck festival. Prospect Avenue, 2 to 6:30 p.m. All proceeds benefit charity serving the hungry. Details and food trucks listed on the Food Truck Fest website. Terhune Orchards 40th Anniversary Celebration -Pam and Gary Mount bought the original 55-acre Terhune Orchards in 1975. Since then the farm has grown to 200 acres. Stop by the farm on Cold Soil Road for a behind-the-scenes tour of the farm at 1 p.m. Light refreshments, including cider and donuts, will be served at a reception at 12:30 p.m. before the tour both days as a thank you to customers. Visitors to the winery tasting room will receive free wine tastings Saturday and Sunday from noon to 5 p.m. Local artists from ArtSpace and the Creative Collective will have their work on display. ArtSpace is a HomeFront program. The Creative Collective is a community network of artists and artisans in Mercer County. Celebration reception and tour both days, Saturday and Sunday, April 25-26, 12:30 p.m. to 2 p.m.
Princess Party – Join Quaker Bridge Mall for a royally fun time at the Kidgits Princess Party. Local Kidgits members can sing and dance with their favorite princes and princesses including Cinderella, the Prince and Jasmine, and enjoy family-friendly activities like craft making, game playing and more. Attendees will also receive a special gift, while supplies last. Not a Kidgits member? Purchase an annual membership for just $5 per child. 1 p.m. Quaker Bridge Mall Center Court. Insight Meditation Open House with James Pritchett and Martha Elliot – Whether you are curious about meditation as a way to deal with stress and calm your mind, or you are a long-term meditator who wants some fine tuning, you are invited to explore Insight Meditation, known in Asia as Vipassana. At the heart of Insight Meditation is the practice of mindfulness – a process that cultivates a clear, non-judgmental awareness of our thoughts, and actions. You will get the opportunity for periods of sitting and walking meditation and time for questions. Open to beginners and experienced meditators. 1:30 p.m. Princeton Center for Yoga & Health, 88 Orchard Road, Skillman, NJ 08558. 609-924-7294. Free (donations welcome). ShadFest – This year’s Shad Festival on Saturday and Sunday, April 25 and 26, noon to 5 p.m. in Lambertville will feature more performing arts, including an open-air performance space that will be filled by Roxey Ballet dancers throughout the two-day festival. More than 150 original art posters, created and donated by area artists, will be displayed during the festival. They are auctioned off on Sunday at 3 p.m.; proceeds fund scholarships for local students pursuing college art degrees. Admission to the street festival is free, but be prepared to pay for parking. Food and many other vendors, children’s activities, and more. Nearly 100 artists and crafters, said Morgan, will line Union Street, which will be closed to traffic from Ferry to York streets. Apparel, ceramics, furniture, framed art, jewelry, accessories, and home décor are among the offerings. minutes. 3 p.m., Princeton Public Library Community Room. Free. “Memories of Maya” – The Witherspoon Street Presbyterian Church at 124 Witherspoon St. in Princeton will present Cecelia B. Hodges in “Memories of Maya,” a one woman show remembering the wisdom of poet and American treasure of Maya Angelou, through poetry and prose. 5 p.m. Admission is free and open to the public. Reading by local authors Patricia Fernández-Kelly and Yessica Martínez – Both authors will read excerpts from their work conveying the experience of life among two different groups of people relegated to the margins of American society. Fernandez-Kelly is a professor of sociology at Princeton University and Grammy Award winner. She will be reading from her book, “The Hero’s Fight.” Martinez is a graduating senior at Princeton and this year’s winner of the prestigious Pyne Award, the highest honor bestowed on a Princeton undergraduate. She will be reading from her senior thesis, a collection of poems that will soon be published under the title “A Tale of Conquering.” The event is a benefit for LALDEF. 4 to 6 p.m., Nassau Presbyterian Church, Admission $30, $10 for students. Mary Chapin Carpenter with Special Guest Lúnasa – Five-time Grammy Award-winning singer-songwriter, 2012 Nashville Songwriters Hall of Fame inductee, and Princeton native Mary Chapin Carpenter returns to her hometown with an intimate, acoustic performance at McCarter Theatre. This tour marks Carpenter’s return to singing both timeless hits and deep cuts from her expansive and beloved 13 album catalog after performing with orchestras in early 2014. Carpenter will be joined on stage by longtime friends Jon Carroll (piano) and John Doyle (guitars, bouzouki). Over the course of her career, Carpenter has won five Grammy Awards, two CMA awards, and two Academy of Country Music awards for her vocals. Opening for Carpenter is the Irish acoustic group Lúnasa. This internationally acknowledged band is renowned for their stunning shows honed by superb musicianship and a constant touring cycle. 8 p.m. Tickets $42 and up. Annual Joe R. Engle Organ Concert featuring organist Michale Gittens and the Princeton Seminary Chapel Choir – Princeton Theological Seminary’s annual Joe R. Engle Organ Concert will be held on Saturday, April 25 (rescheduled from February 21) at 7 p.m. in Miller Chapel. The concert is open to the public free of charge. Featuring Michael Gittens, director of music at the historic Kaighn Avenue Baptist Church in Camden, New Jersey, and choral assistant at Princeton Seminary, as well as the Princeton Seminary Chapel Choir. Miller Chapel. Free. Adam Ezra Group Performs at the Princeton Elks Lodge – Adam and the band will descend on Hopewell Valley, NJ for a night of intense music, dancing, drinking and fun. The Adam Ezra Group is committed to changing the world with their songs and their actions along the way. Ezra and his band are activists and community leaders as much as they are musicians and songwriters. Ezra has spent time living out of a van, farming in Canada, volunteering for the relief effort in Kosovo, and practicing environmental geography in South Africa. Whether as a kitchen hand or carpenter, teacher, athlete, or traveler, Ezra crams it all into the music, always challenging our perspective and often teetering somewhere between the ballsy rocker and sensitive poet. Through their non-profit organization, RallySound, AEG helps people organize live music events that inspire communities and encourage grassroots activism. Show at 8 p.m. at the Elks Lodge in Skillman. Click the link to purchase tickets. Cafe Improv – Music, poetry, and more at the Arts Council of Princeton. Come for the whole show or stop by and catch a few acts. At $2 a ticket, Cafe Improv is an entertainment bargain. 7 to 10 p.m.
Communiversity – Nassau Street, Witherspoon Street, and the lawn in front of Nassau Hall at Princeton University are turned into a big block party. Performances, food vendors, arts and crafts for sale, information from area non-profits. 1 to 6 p.m. rain or shine. Walk in to town or take public transportation if you can. Communiversity shuttle will transport passengers from the shopping center to the festival entrance at the corner of Wiggins and Witherspoon from 12:30 to 6:30 p.m. Look for shuttle signage at the side of Sherwin Williams at Princeton Shopping Center and by the ACP’s Paul Robeson Center. For a full list of booths and a map, click the link. Jewish Authors & Family Fun Day – Meet best-selling Jewish authors of acclaimed childrens & young adult books. Books Signings, Stories Alive & Fun Family Activities. Books will be available for sale (cash or check only). Portion of all proceeds will go toward the JCC Abrams Camps Scholarship Fund. Begins at 1 p.m. 99 Clarksville Road, West Windsor. Free. session, including building time and round-table discussion. 3 p.m. The Princeton Opera Alliance show is on Sunday as well. Nothing about TEDx on Saturday at the library?